← At Last! Broom 3 is on the American Flying Broomstick site! Norm is correct. I might also note that in researching this, Wikipedia states that 2710 of these handy, easy-to-build cargo ships were built during the war years, not quite measuring up to the “over 3000” on page 90. That still a lot of ships! 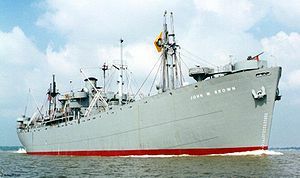 Out of all these ships, only two are still seaworthy, the SS John W. Brown (pictured) and the SS Jeremiah O’Brien, the latter being preserved as a memorial in San Francisco with occasional trips at sea. The SS Otto Mears itself was launched in 1943, sold private in 1947, and wrecked and scrapped in 1967. How’s that for information in a book about railroads! Check out Narrow Gauge Railroading in the San Juan Triangle: The Rio Grande Southern, the Ouray Branch of the D&RG and Otto Mears’ Silverton RR, in our catalog for $19.95 + shipping. You can be assured that Otto Mears was a railroad guy; it’s interesting to learn of the ship built twelve years after his death that was finally scrapped when Mears would have been 128 years old. This entry was posted in Railroad, Reader Comments. Bookmark the permalink.